The Irish government faces a tough battle to get the EU's Lisbon Treaty ratified in a referendum next month, the country's foreign minister says. Micheal Martin was speaking after a new opinion poll suggested a drop in support for the treaty. "I was never under any illusion but that it would be difficult to secure this, but I do think we can do it," Mr Martin said on Ireland's RTE radio. The treaty was rejected in a referendum in the Republic of Ireland last year. Ireland is the only one of the EU's 27 member states to put the treaty to a referendum. The complex document, drawn up after years of negotiation, is aimed at streamlining EU institutions. Mr Martin stressed that the government had "succeeded in ensuring every country retains a commissioner" in the EU. "There is a very significant challenge ahead, it's going to be a very tight campaign and it will demand all of the resources, conviction, politics and passion of all of those on the Yes side," he said. The parliaments in nearly all of the 27 member states have ratified the treaty, but it cannot enter into force unless all the countries ratify it. An Irish Times/TNS opinion poll published on Friday showed 46% of respondents would vote Yes - an eight-point fall since the last such poll in May. Opposition to the treaty stood at 29% - a one-point rise. The figure for "Don't Knows" was 25% - a seven-point jump. The poll sampled 1,000 voters nationwide earlier this week. Dublin has secured binding EU guarantees that the treaty will not affect Irish sovereignty over key issues such as military neutrality and abortion. These issues, along with taxation policy, were identified as major concerns of Irish voters after the June 2008 referendum. 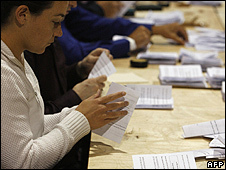 The second Irish vote, on 2 October, is seen as the last major hurdle delaying Lisbon's entry into force. The treaty's opponents argue that it is just the defunct EU Constitution repackaged, and say it will undermine national sovereignty. The constitution was rejected by French and Dutch voters in 2005. EU leaders and other pro-Lisbon politicians say the treaty is needed to make the enlarged 27-nation EU more efficient. Under Lisbon, the six-monthly rotating EU presidency would be replaced by one that runs for two-and-a-half years, there would be a powerful new foreign affairs chief and the European Parliament would gain wider powers. The treaty would give the parliament a bigger say over the appointment of the new European Commission and would boost the number of Euro MPs from 736 to 754. But the number of commissioners would be kept at 27.